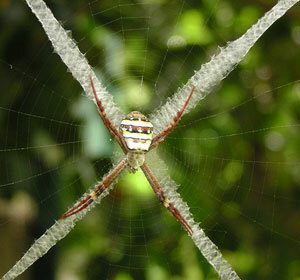 The St. Andrew's Cross Spider, is easily recognised due to the white cross in the middle of its web - which resembles the cross of St. Andrew. 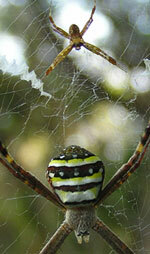 The female's body is 15mm in length with a toe to toe diagonal length of 50mm. 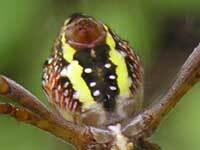 The male is about a third of the size as shown in the image. He approaches the female with caution because he may end up being her meal and not her mate! 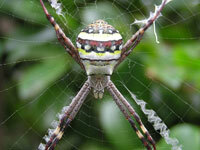 The pattern across each spider's back differs slightly from spider to spider. The pattern underneath runs length-wise. 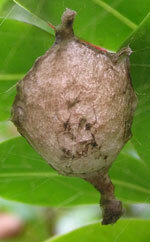 The egg sac is formed near the web. 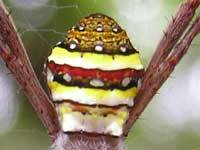 And the tiny spiderlings disperse within a few days of hatching. 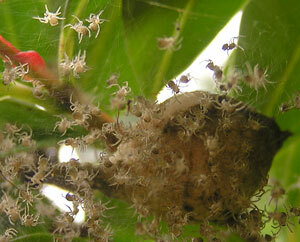 Here's another image of the spiderlings dispersing. These photos were taken in Cheltenham in Sydney.